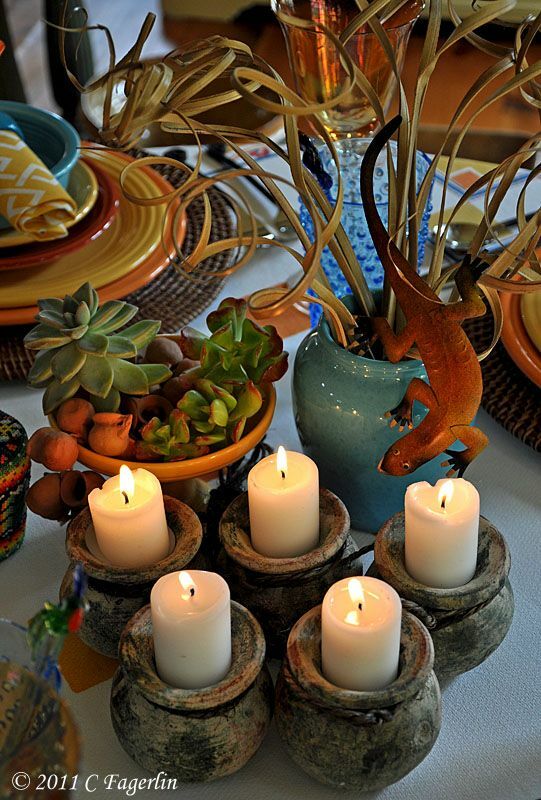 Many collectors participated in this celebration of Southwest and Mexican themed tables. Such a wide variety of interpretations and great dishes! Elaine will be expanding on this celebration in future issues, so the party will go on and on! Thanks Elaine for such a great party! This was my contribution to the Mexiscapes. Alphabe-Thursday at Jenny Matlock for the letter "H"
"H" is for hacienda. Welcome to my hacienda! "H" is for huevos con picadillo, that's eggs with spicy Spanish sausage! "H" is for helado de chocolate. Mmmmmm chocolate ice cream! "H" is for HAPPY! I'm so HAPPY you came to the Mexiscape Party! Always such pretty pops of color! 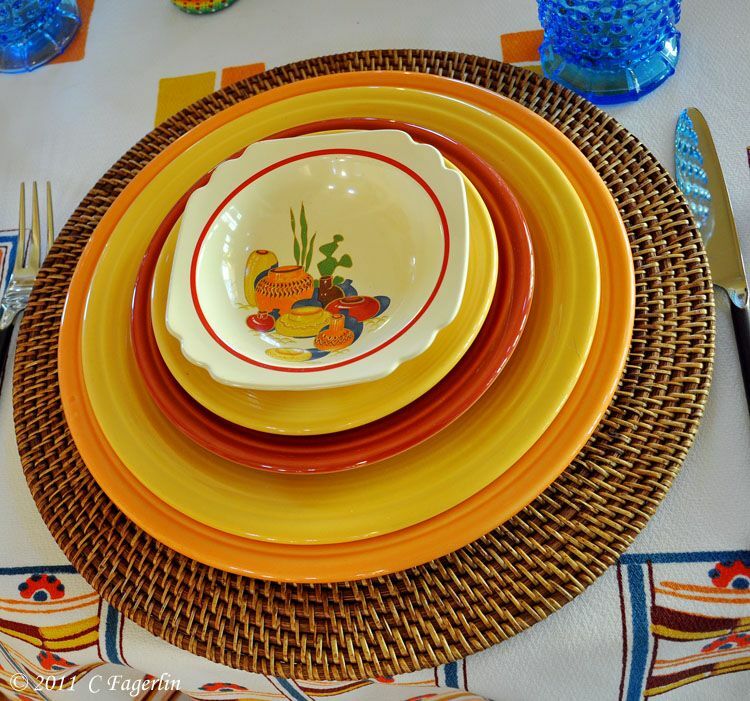 Love your tablescape! I just love, love,love how your blue glasses pop against those warm tones! 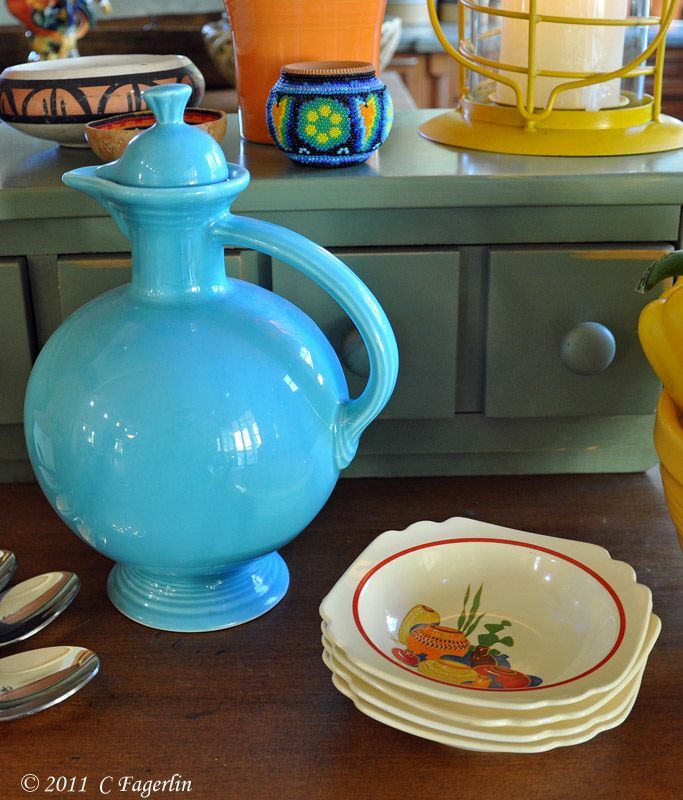 new follower from linky party at no minimalist! Oh how fun and colorful! 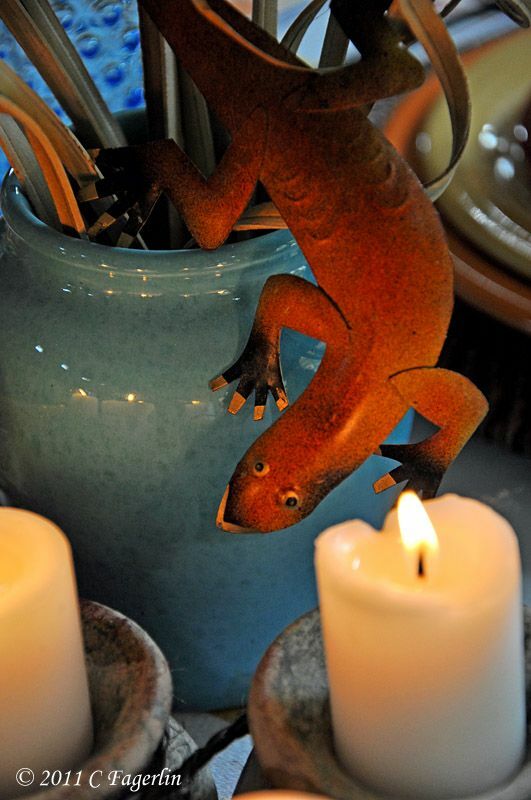 Love your pottery with the candles. Wow! 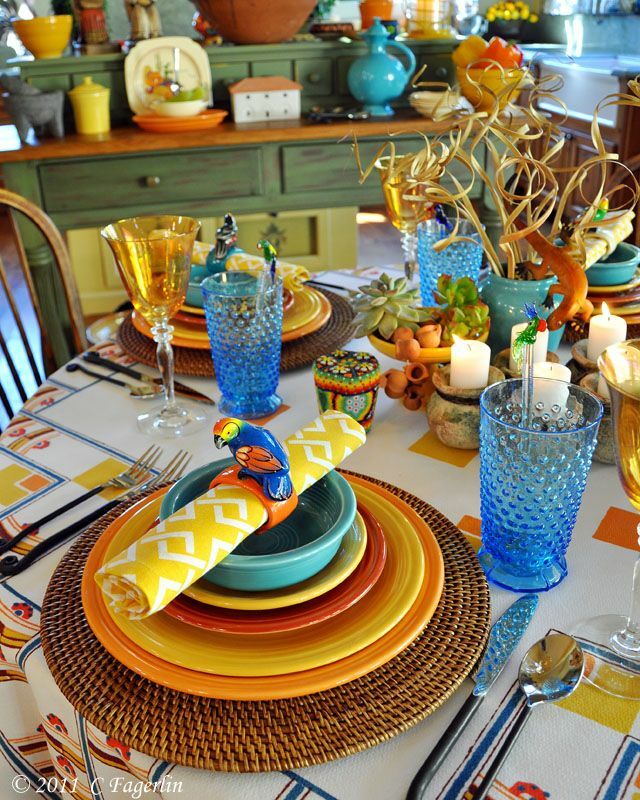 I love how colorful your table is! 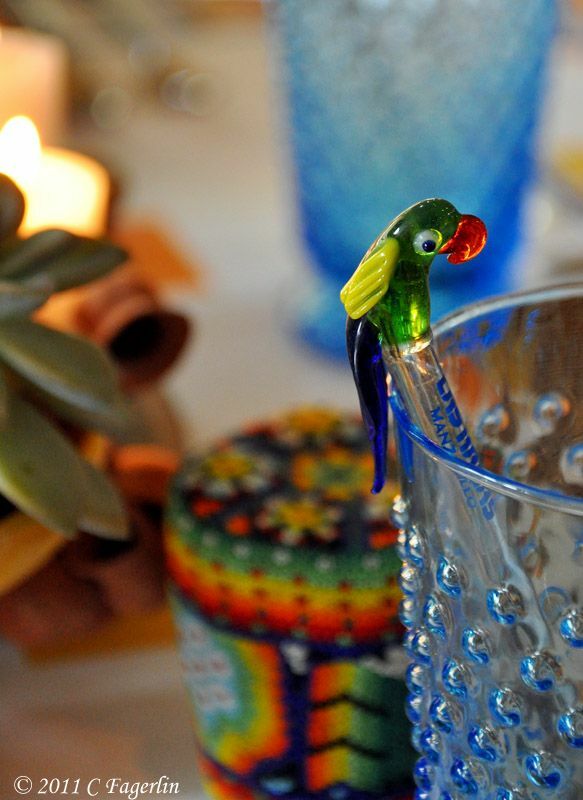 Those napkin holders are just so over-the-top fun! Thanks for sharing. 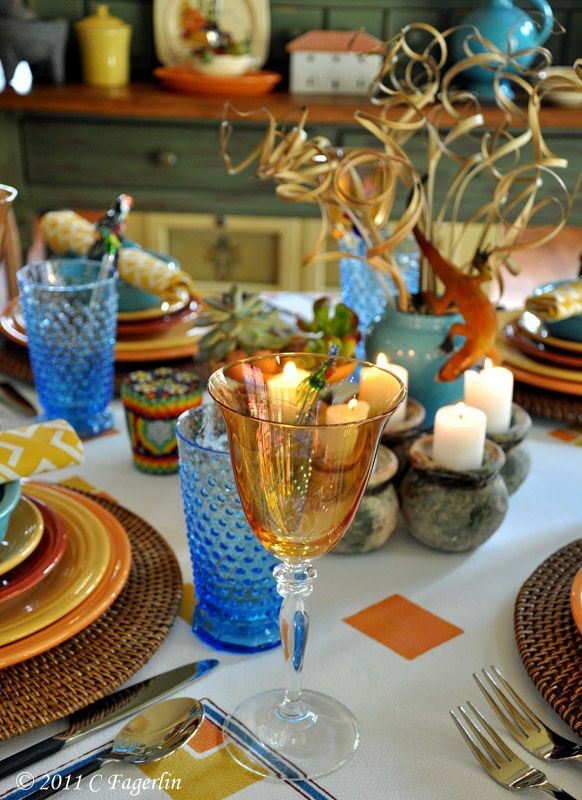 Beautiful table setting!!! 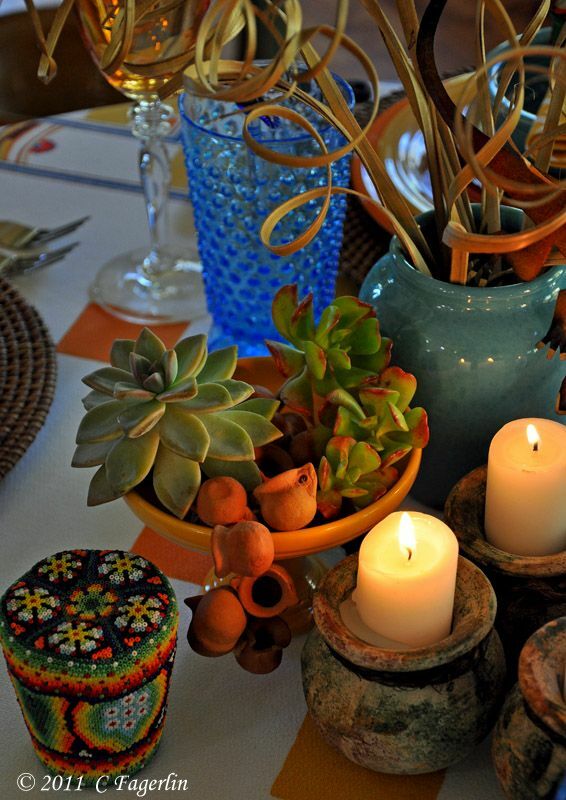 Lovely warm colors...Loved all the tiny details!!! 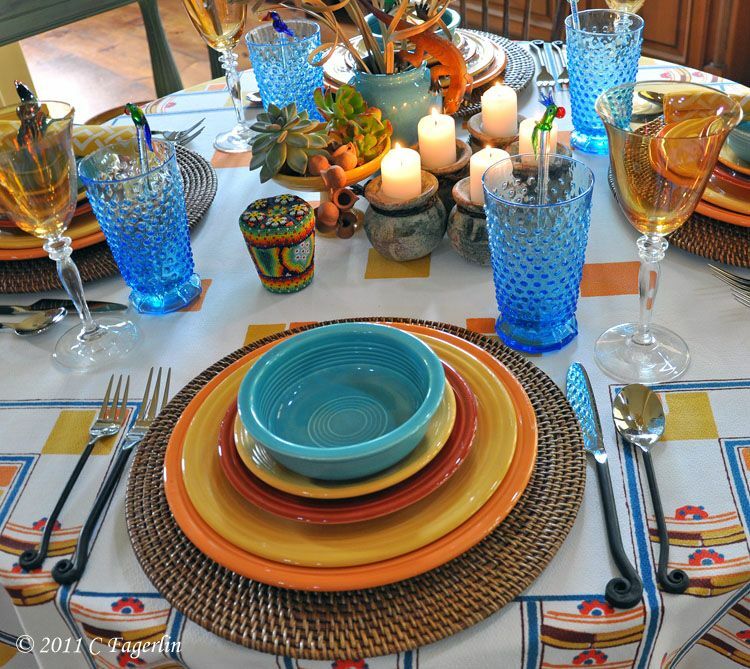 What a happy tablescape! 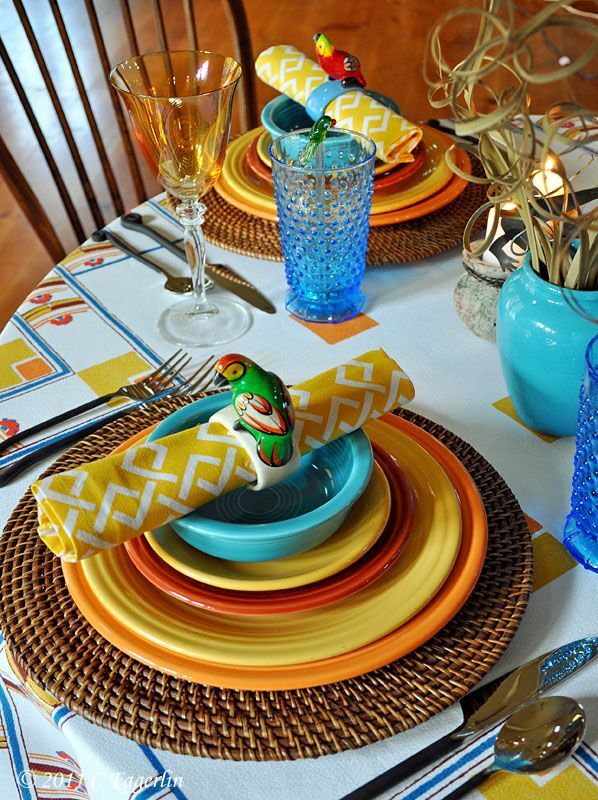 I just need a margarita to go along with your inspired colors and designs! Thanks for a happy stop this week. Thanks for stopping in and for your lovely comments! 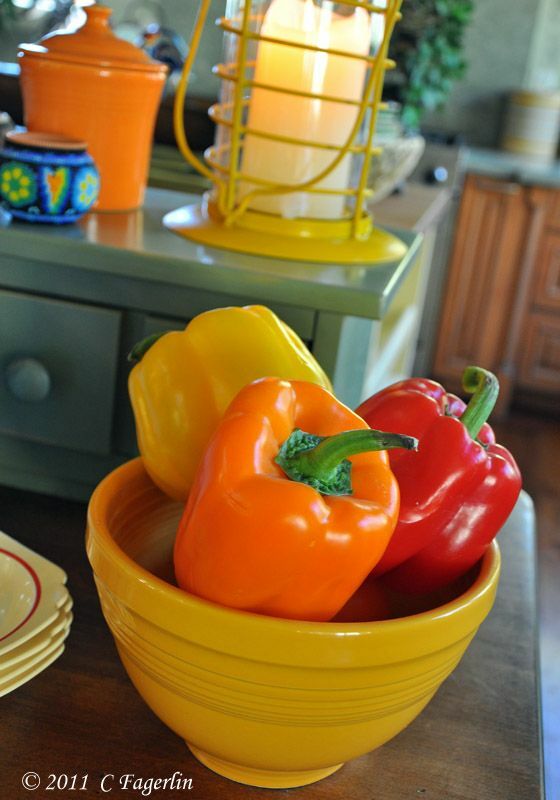 These colors will brighten up any table even on a gloomy day. I love the table! 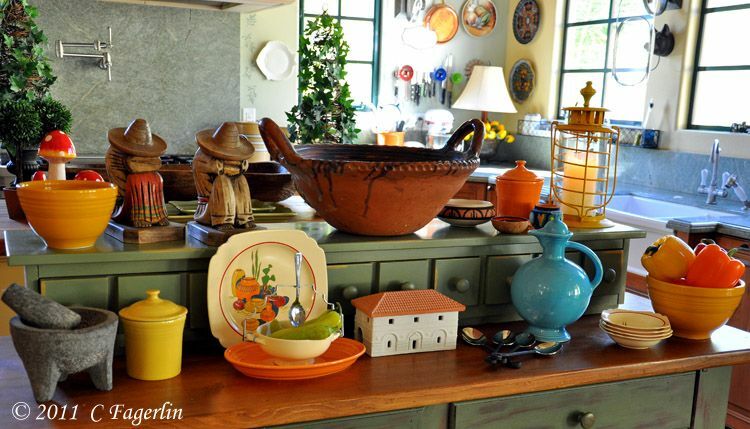 And your kitchen is gorgeous!! 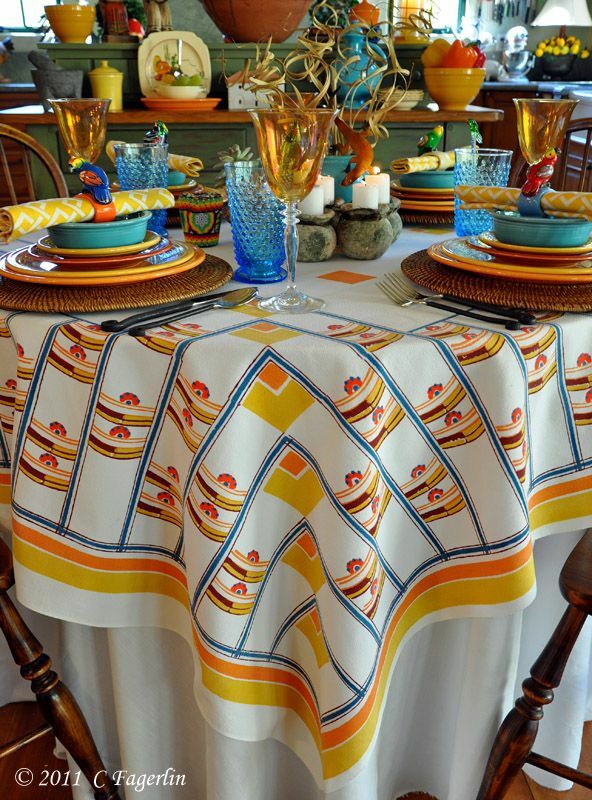 Candy, you're tables are always so well done, and have such a wonderful sense of fun. The photography is also top notch. You go honey. I would love to see this again at my link party. 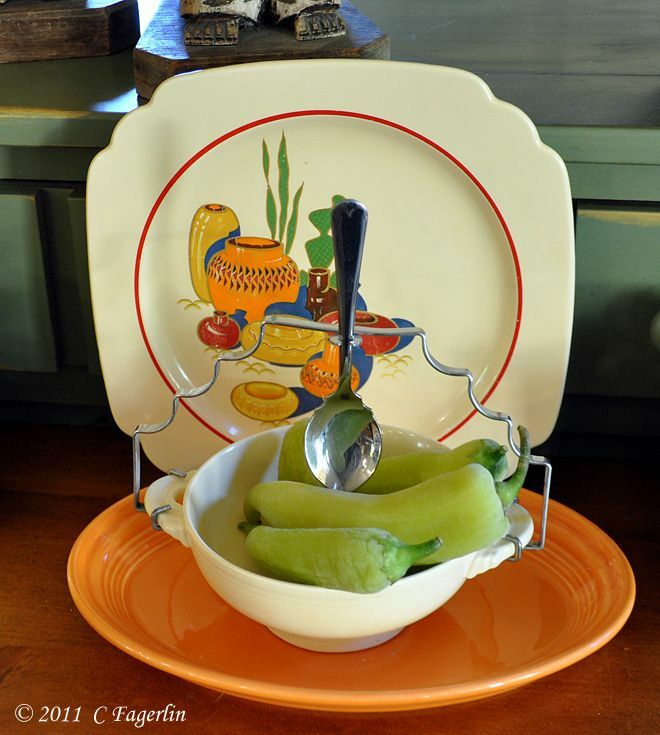 It will be a weekly link up Friday through Sunday. Hope to see you there. You can find the button for it on my blog now if you like. Oh my! Sooooo many details to take in and every one of them charming and festive. 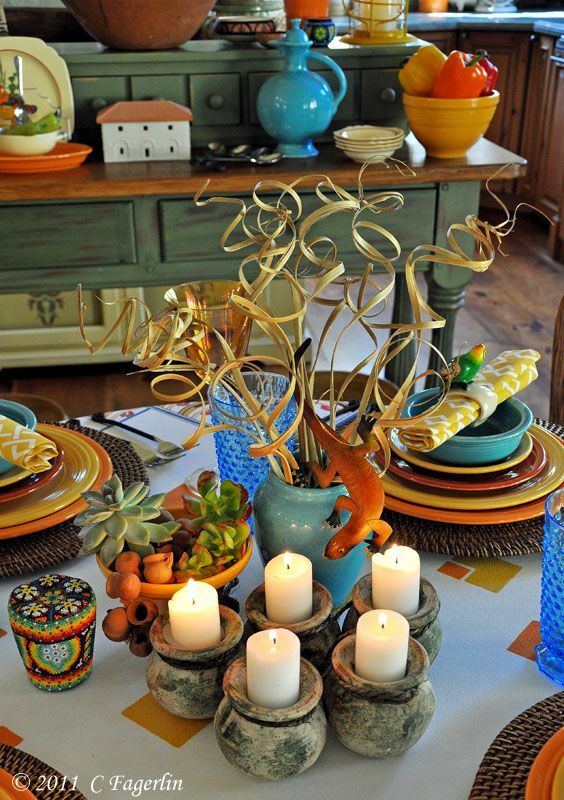 :-) I LOVE those candleholders and if you ever get tired of them you can just send them on my way. 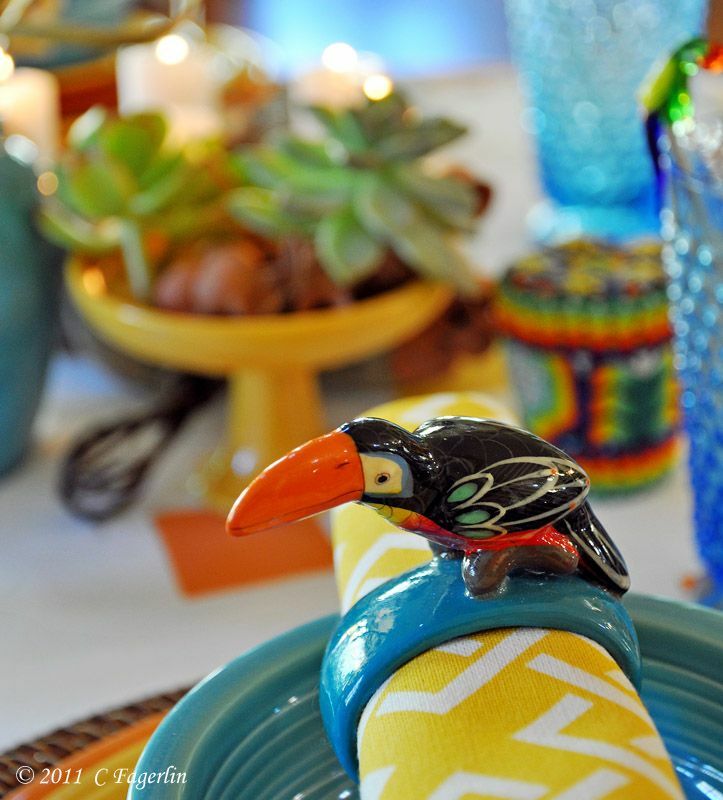 And those napkin rings are so cute. Thanks so much for sharing this with us at Inspiration Friday this week! Hi Candy! Thank you for hostessing Mexi-scape Wednesday. Your table is diva-vine! And I'm finally joining in the fun! 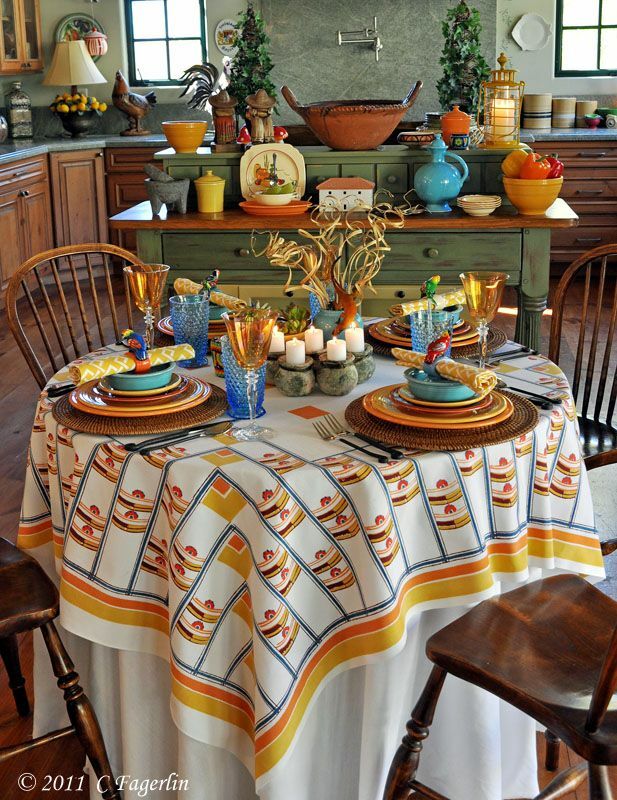 A beautiful, bright and cheery table. I love your blue glasses! 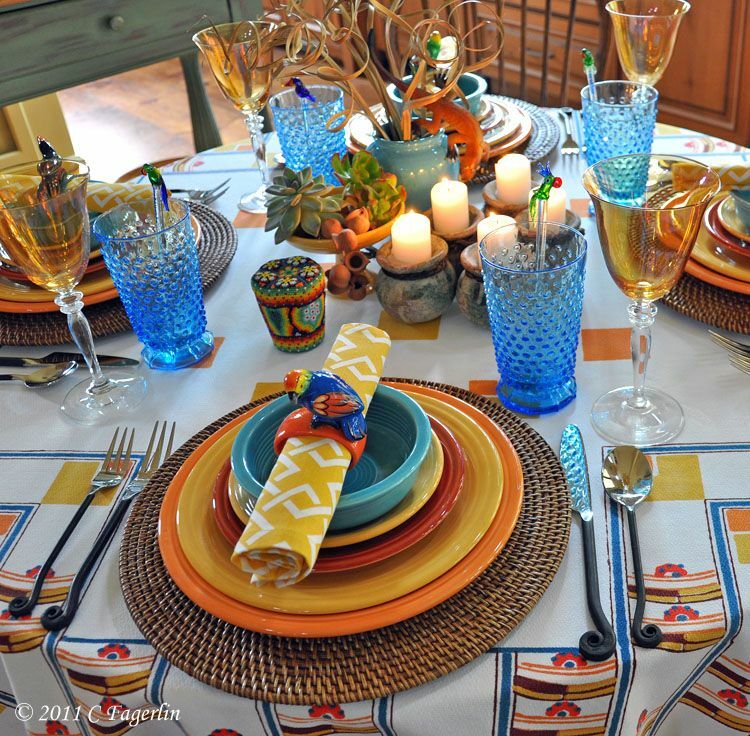 Hi Candy, Thank you for sharing another fabulous table at my party. I always love to see what you create each week. Have a great weekend. 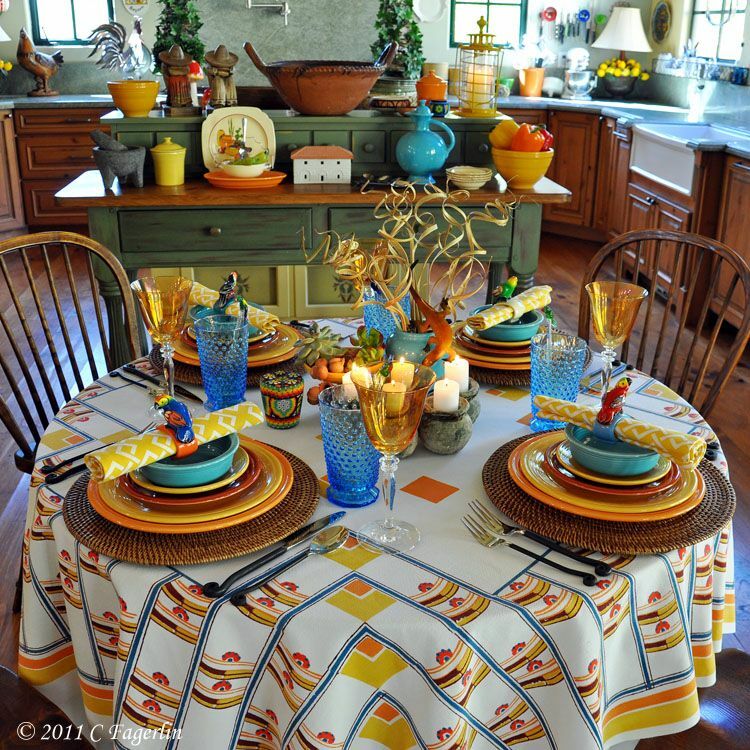 Thanks everyone for coming by to check out this week's tablescape! Becca - Thanks for coming by to add your 'scape! I think credit needs to go to Elaine for coining the term "Mexiscape" as we all exchanged emails to get our images in for her article. Thanks E! Artie - Good to see you again, I did stop by to see your latest creation! 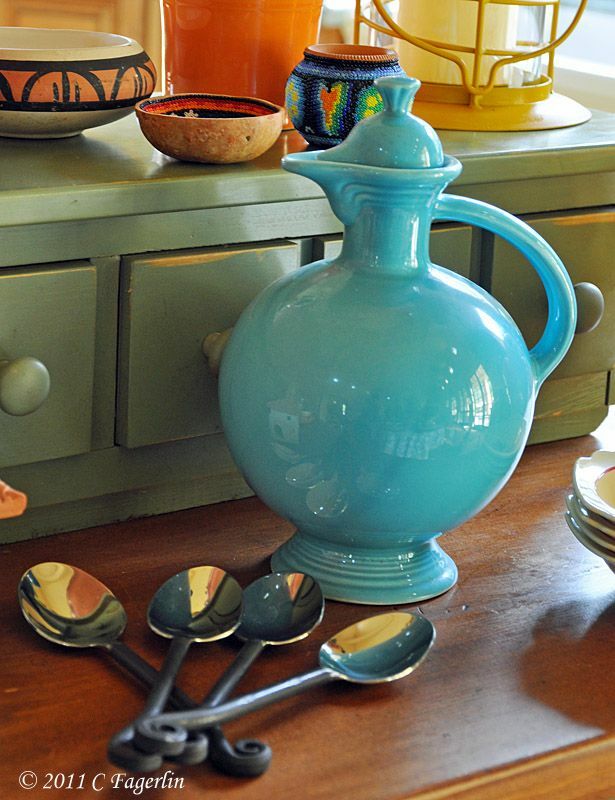 So gorgeous with all the turquoisey blue. Beautiful! 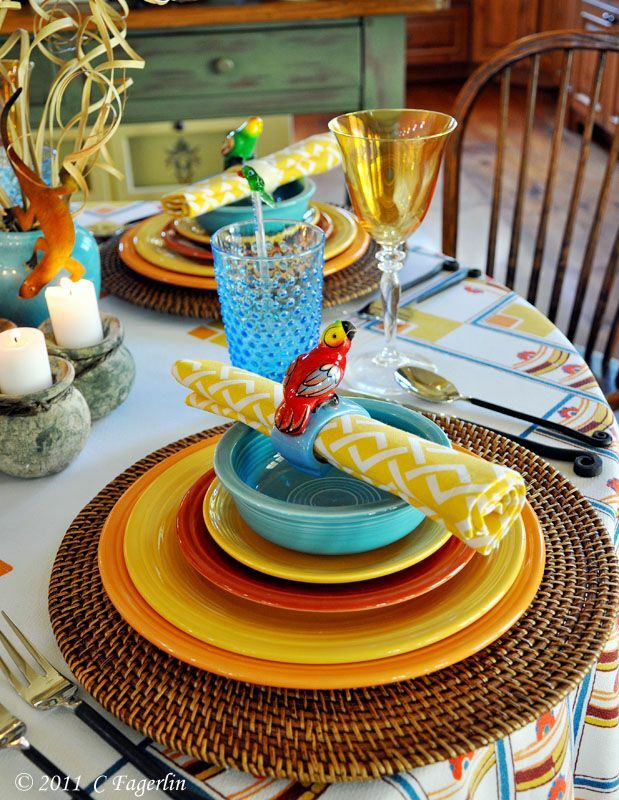 Your tablescapes are always so beautiful! Thank you for sharing. 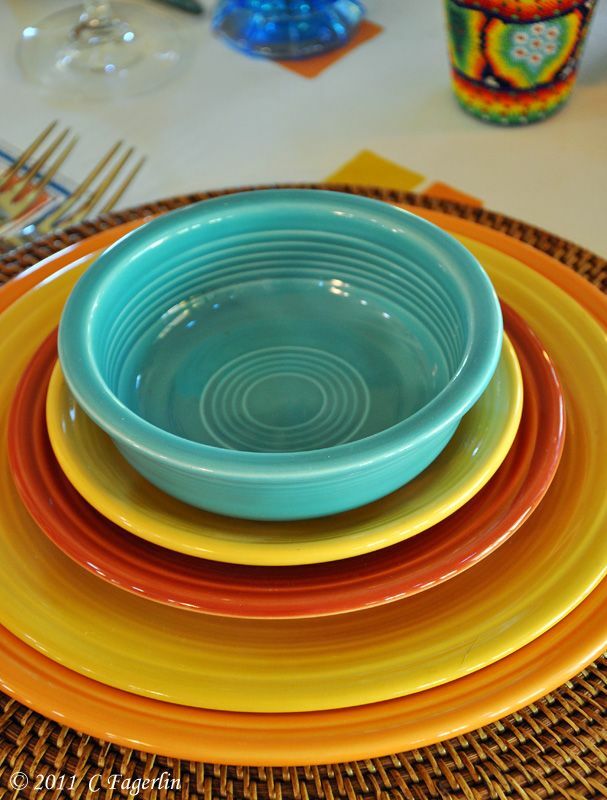 I love your Fiesta ware displays! Thanks for your lovely comments and for stopping by again this week. 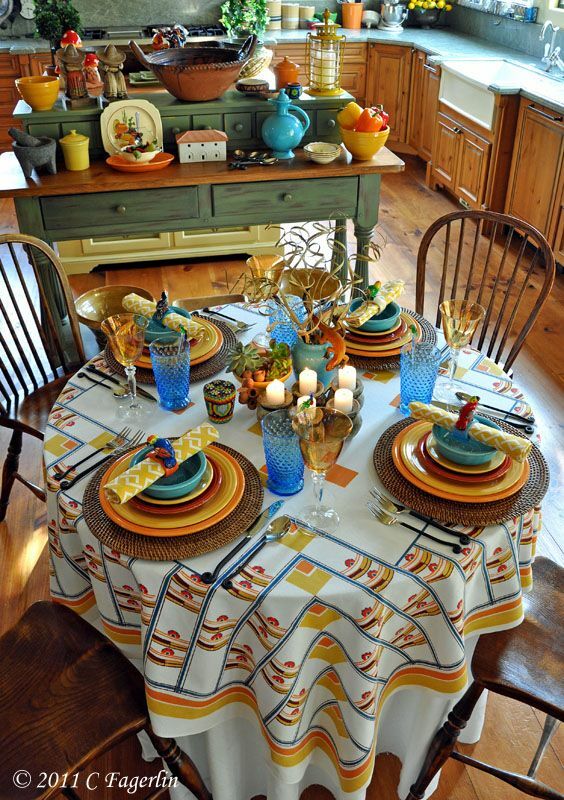 I love this colorful table. It is so fun. 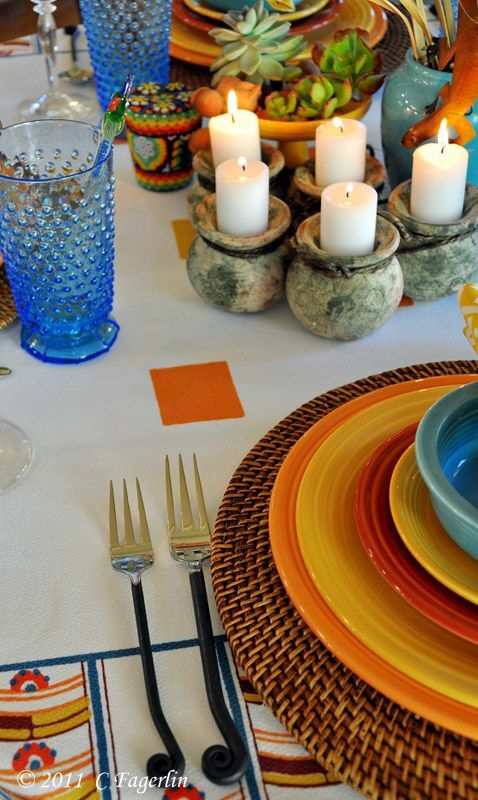 The flatware is perfect with this table. I also love the chargers and the napkin rings. You did a great job on this. Thanks for joining Home Sweet Home! Thanks for coming by Sherry, glad you enjoyed your visit.